Following his opening remarks, Ms. Faridah Luyiga Mwanje, a citizen journalist from Uganda, spoke to the audience about the Citizen’s Hearings, which have been taking place in some 30 countries, involving tens of thousands of citizens and elected leaders, as well as over 400 civil society organizations. Ms. Mwanje handed over a formal statement on behalf of the citizens from around the world on what they would like to see in the next development agenda for women, children and adolescents, to the UN Secretary-General. The opening remarks were followed by a lively panel conversation featuring His Excellency Dr. Aaron Motsoaledi, Minister of Health of the Republic of South Africa, His Excellency Mr. Zahid Maleque, State Minister for Health and Family Welfare of the People’s Republic of Bangladesh, and The Honorable Christian Paradis, Minister of International Development and Minister for La Francophonie of Canada and moderated by Mr. Michel Sidibé, Executive Director of UNAIDS. The panel focused on Member State perspectives on how the updated Global Strategy can support countries to implement national plans. The following panel, moderated by Ms. Kathy Calvin, CEO of the United Nations Foundation, with participation from Mr. Jim Andrew, Executive Vice President, Philips, Ms. Sharon D’Agostino, Vice President, Corporate Citizenship, Johnson & Johnson, and Stella Li, Global Senior Vice President and President of American Region Business for Build Your Dreams (BYD) focused on the role of the private sector. Participants discussed the concrete outcomes of private sector commitments to Every Woman Every Child and how this progress will be built upon during the SDGs. Concluding the panel section of the program, Ms. Juju Chang moderated a dialogue that included Ms. Helen Clark, Executive Director of UNDP, Dr. Babatunde Osotimehin, Executive Director of UNFPA, Mr. Tony Lake, Executive Director of UNICEF, and Ms. Phumzile Mlambo-Ngucka, Executive Director of UN Women. Conversation focused on the role of UN agencies in supporting the implementation of priorities highlighted by Every Woman Every Child. Following the panel discussions, Gogontlejang, a young and vibrant youth activist from Botswana, discussed the role of youth engagement and participation in the development of the updated Global Strategy. Given the updated Strategy’s new focus on adolescents’ health, her remarks were particularly relevant. 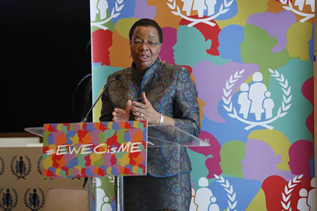 Ms. Graça Machel, Board Chair of the Partnership for Maternal, Newborn, and Child Health and a tireless champion for health and rights of women and girls, provided closing remarks. During her speech she issued a rallying call for everyone in the room to step up, and support the updated Global Strategy for Women’s, Children’s and Adolescents’ Health. If we invest in the potential of women, children and adolescents over the next 15 years, we can end all preventable deaths of women and children in a generation. 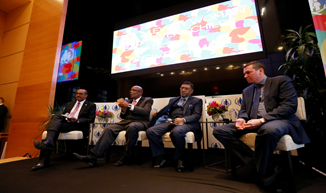 At the event, Every Woman Every Child also launched a new digital media campaign, Every Woman Every Child is Me. To learn more about the campaign click here. 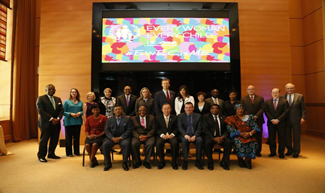 Following the luncheon, a smaller group of about fifty leaders gathered for a private retreat for a detailed conversation on the draft and direction of the Global Strategy for Women’s, Children’s and Adolescents’ Health ahead of the World Health Assembly taking place in Geneva next week. To view the UN Secretary-General’s remarks click here. To view photos from the event click here. A one pager on Every Woman Every Child is Me can be found here. A social media toolkit for Every Woman Every Child is Me can be found here.